Rent The Gurney Lane Picnic Pavilion In Queensbury! Have a summer event coming up but not sure where to host it? The Picnic Pavilion at Gurney Lane Recreation Area in Queensbury is a perfect spot for having fun in the sun! The Gurney Lane Pavilion and Picnic Area Party Tent are available for daily rent during the summer months for $125.00 per day. This open air pavilion contains 10-12 picnic tables and is perfect for larger gatherings up to 100 people. The 60' x 25' space is conveniently located near the children's playground, pool house bathrooms and open grass areas, as well as 2 in-ground cooking grills, half-court basketball, nature trails, a fishing pond, and even an outdoor swimming pool. For a smaller gathering, the Picnic Area Party Tent could be the perfect solution! The picnic area is 20' x 30' in size, containing 4-6 picnic tables, 1 in-ground charcoal grill and can accomodate approximately 50 people. 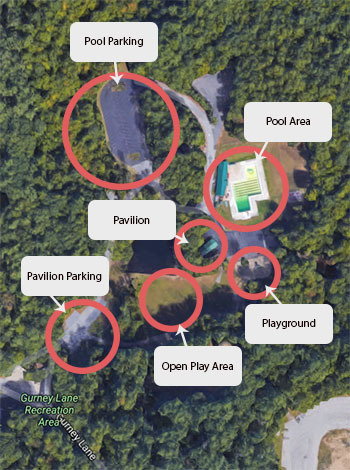 In lieu of a $5.00 per person pool admission fee, Gurney Lane offers group admission for pavilion or picnic area renters. For pavilion renters, admission to the pool is an extra $100. For picnic area renters, pool admission is $50. Children under 5 and seniors 60+ are free. For more information on pavilion or picnic area rentals, call the Queensbury Department of Parks & Recreation (518) 761-8216. Reservations can be made in person at the Parks & Recreation Office, 742 Bay Road, Queensbury, New York or online at queensburyrec.com. To guarantee a date, a registration and payment must be processed.